It’s Tax Day, so let’s talk about taxes. Conservative ideology says cutting taxes makes the economy grow. This Tax Day let’s explore whether this is, in fact, the case. In the last few decades we as a country have conducted textbook scientific experiments with taxes. 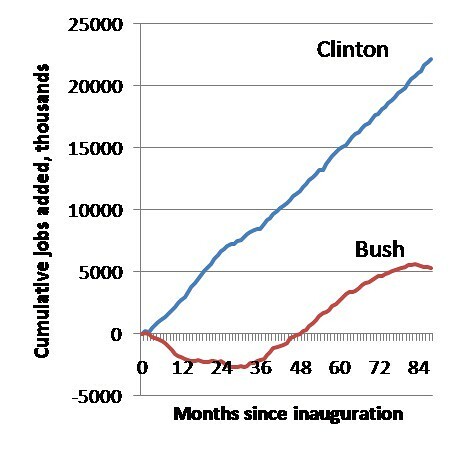 Under Reagan we dramatically cut taxes at the top, under Clinton we raised them a bit, and then under Bush we cut them again. So now we can look at what happened: Did cutting taxes make the economy grow? Science looks at the effect of tax cuts on growth in the past, and over time. Then policy can realistically be adjusted for the best outcome. Since 1980 we have cut taxes a lot, then raised them, then cut them. Did the cuts result in economic growth, and did increases result in recessions? Ronald Reagan applied ideology to our government’s finances and cut taxes from the then-top rate of 70% down to 50%, and then, later, to 28%. (George HW Bush raised top tax rates to 31%.) 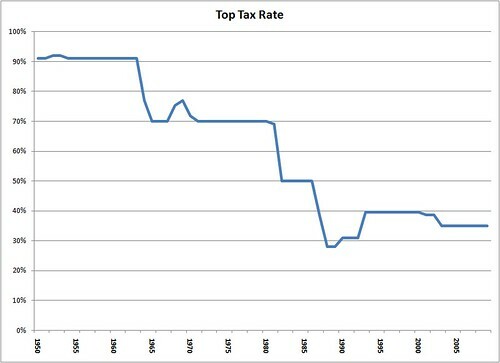 The top corporate tax rate was cut in 1987 from 46% to 40% and the next year to 34%. It turned out that if only (and a unicorn) didn’t work out so well when it hit the wall of reality. Now We, the People are suffering the consequences. Conservatives say that the economy boomed, and more revenue came in because of the tax cuts. What actually happened was government deficits and the resulting accumulated debt exploded, while our defunded government has since been unable to maintain the infrastructure and public structures (laws, courts, regulations, protections, schools, etc…) that keep our economy competitive and our standard of living high. All you have to do is look at the record. Let’s do that here. In 1981 — Carter’s last budget year — the on-budget (not from Social Security) tax receipts were $469 billion which was a 16% increase over the prior year. 1982 tax receipts were $474.3 billion, down to 1.1% over 1981, and the on-budget deficit shot up to $120 billion, a shocking increase of 62% in a single year! 1983 receipts were $453.2 billion, a drop of 4.4%, creating a deficit of $208 BILLION — an increase of 73%! In just those two years following the tax cuts our debt increased by $328 billion! When conservatives tell you, “Reagan cut taxes and revenue increased,” they don’t mention those huge tax increases. Nor do they mention the revenue drop following the tax cuts. The size of the economy increases over time anyway, so there is a natural rate of increase that occurred as well. Saying the Reagan tax cuts increased revenue is like saying you skipped lunch and gained a few pounds, without mentioning the 12-course dinner with three deserts. In 1993 Bill Clinton fought to raise top tax rates on the wealthy from 31% to 39.6%. Conservatives said the tax increases would destroy the economy and kill job growth. There is an eight-year record showing what actually happened after taxes were raised. Then in 2001 George W Bush cut taxes again and unfortunately there is another 8-year record of the consequences. A comparison of economic performance under these two-term presidents and their tax policies is as close as we can get to a carefully-structured science experiment. Let’s see what happened. What do these charts tell us? 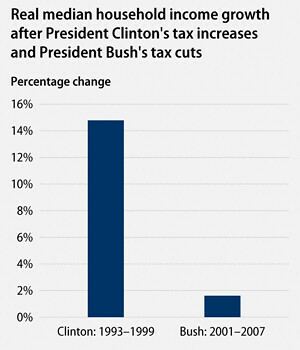 * Following the Clinton tax increases the economy did much better than it did after the ‘W’ Bush tax cuts. 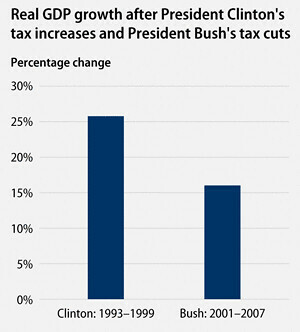 * Following the Clinton tax increases job growth did much better than it did after the ‘W’ Bush tax cuts. * Following the Clinton tax increases real median household incomes did much better than it did after the ‘W’ Bush tax cuts. 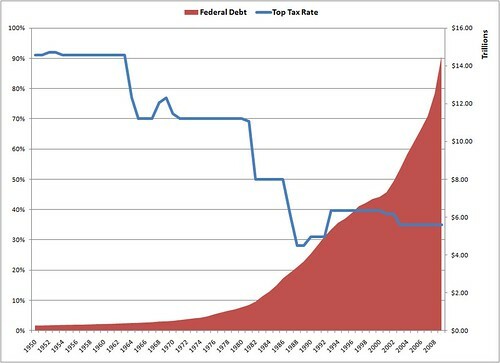 * Following the Clinton tax increases the deficit went down and eventually the government started paying off its debt. 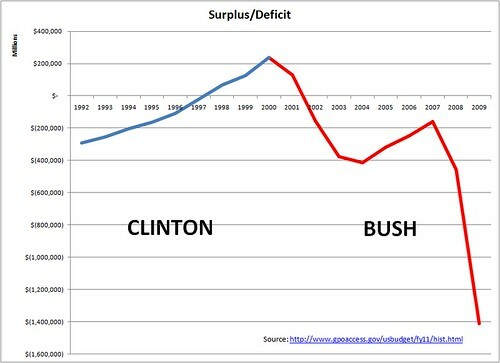 The deficits exploded after the ‘W’ Bush tax cuts. The longer-term picture tells the same story. 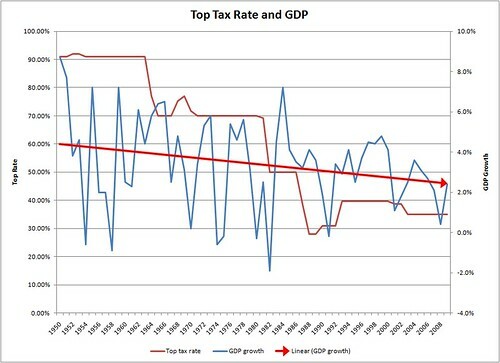 The record shows that in periods of highest taxes the economy grows the most and in periods of low taxes is grows the least. While this does not prove causation, it certainly contradicts conservative claims that high taxes kill growth and jobs, while low taxes boost growth and jobs. Investing In Our Economy Grows Our Economy. A properly functioning democratic government that is not obstructed by ideology invests and regulates and protects and ensures that all businesses get a chance to succeed or fail on their merits, not on lobbying and tax breaks and crony contracts and by crushing smaller businesses. 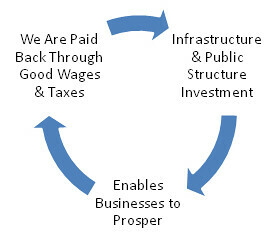 A properly functioning democratic government is able to tax the most wealthy and powerful to help pay for the necessary investment in infrastructure, public structures, education and the rest of the things that keep the economy going into the future. If we spend money on improving the country’s infrastructure, we get all the job creation that comes from that work, and the next year you have that infrastructure there to help drive the economy. Lowering taxes can provide a short “stimulus” boost while it is consumed, but at the cost of borrowing the money instead of taxing to pay for government, with the resulting long-term drag on the economy from paying the interest on that borrowing. Obviously the same amount of stimulus used for investment in infrastructure, education or direct job creation instead of taxes would have more immediate effect and the resulting payoff usually more than covers the interest. 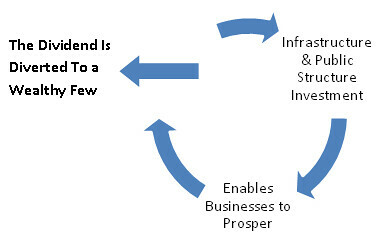 Borrow to invest, not to consume. Tax cuts don’t grow the economy, they grow the debt. Beyond the terrible budgetary consequences of tax cuts for the rich we also saw societal consequences. The social contract was broken, the wealthy were no longer asked to pay back society for the opportunity we had provided. Since it no longer took time to build a fortune there was a shift in business models from building long-term, sustainable, customer-supportive businesses to fast-buck, customer-exploiting, job-killing outsourcing, everything-to-the-top schemes. The incentive to reinvest in healthy communities disappeared.
. . . We must recognize and understand these tax cuts for what they are. They are a broken contract. These tax cuts for the wealthy are theft. And we must recognize the Reagan Revolution for what it has cost us. Our democracy has been corrupted and our political system has been captured. A wealthy few are taking all of the benefits of our efforts for themselves. The lack of investment in infrastructure, courts, schools and other public structures is making our country less competitive in the world. The Reagan Revolution is stealing our future. It Didn’t Work So Do More? Today ideology still dominates and conservatives are calling for even more tax cuts. 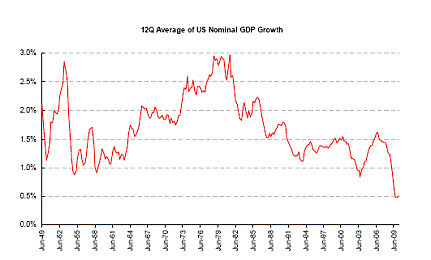 In spite of the record, the ideologues still say, “A recession is the wrong time to raise taxes” because “taxes take money out of the economy.” Just last week House Republicans passed a budget that cuts rates for the wealthy, which were 90% for decades and then 70% before tax-cut fever brought us the huge deficit, to 25%. And also cuts corporate taxes – 90% of corporate stock is owned by the top 10% – to 25%. They say more tax cuts will “promote growth and job creation.” But all we have to do is look at the record to know what will happen if this takes effect.